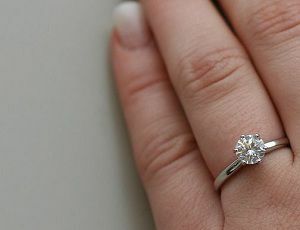 Home » Smart Spending » How Much Should You Spend on an Engagement Ring? Whether you are surprising your significant other with a marriage proposal or working together to select what she likes, buying an engagement ring can quickly become an expensive task. There are so many “rules of thumb” surrounding how much to spend on an engagement ring that it can be hard to decide what to do. Thankfully, we have the answers. With all of the diamond marketing out there it can be easy to convince yourself to spend as much money as possible on an engagement ring. But is that a smart move? You’ve surely heard this common phrase. Marketing from diamond cartel DeBeers has been fantastic over the decades to the point that it is drilled into practically every woman’s mind that they must have a diamond engagement ring. And of course, if that’s what the special woman in a man’s life expects, that is what she is going to get usually. Unfortunately, diamond prices are kept high through careful supply and demand management. That, mixed with it being difficult to tell a quality diamond from an average diamond to the naked eye, leads to a lot of pricing error for consumers. Every single boyfriend has heard this phrase to spend two months of their earnings to buy an engagement ring. That is a ridiculously significant chunk of cash for most people. This can also lead to garishly large diamonds or rings that look disproportionate on a woman’s finger. In short, marketing is just that, marketing. The diamond and jewelry companies are encouraging you to spend as much money as possible for their benefit. Instead of throwing away two whole months of earnings, here’s a novel idea: spend what you can afford to spend. If you can’t get married because you can’t afford the obnoxiously large engagement ring your significant other demands then perhaps getting married to them is a bad idea. Make a sensible choice. Set a savings goal and work your way up to the goal. Don’t go into debt or get jewelry store financing to buy the thing — that’s no way to start a marriage. Another idea is to go with something completely unique. Who said diamonds were the only choice for engagement rings? There are a multitude of other gems available — and that’s if you decide that you even need a gem. Your engagement ring should be a unique identifier of your loving relationship, not your willingness to sacrifice cash. Engagement rings and specifically diamonds have been marketed heavily for decades. This has kept demand high. Supply is kept lower than necessary due to the diamond cartels. This all results in you spending a ton of money on an engagement ring. Ignore marketing that tells you how much of your money to spend on a ring. Set a spending goal, and save up for it. Spend what you can afford on a ring. Save money by avoiding diamonds; get something unique instead. This is a good article that does take the guilt out of the decision for many people. That said, it is good to have balance in this area. A person who would like to have a beautiful diamond is not necessarily a gold digging, obnoxious person. It is a tradition that is important to some people. There is nothing wrong with a person saving up several months of salary in order to get their beloved a nice engagement ring. To say that the person is simply ‘throwing away two whole months of salary’ is a value judgement. Many people would not agree that buying the person you love a special, even an expensive gift, is a waste of money. Investing is wise – both financially and relationally. I picked a ring that I thought was perfect(obviously within reason) for my (now) wife, not by the price. I don’t agree with the silly advertising about sending x times your monthly salary either! I wish my girlfriend would listen to your post! But no she wants a fancy diamond ring… go figure. Girls will be girls. I inherited my grandmother’s wedding ring when she passed away. When I got it, I showed it to my girlfriend and said, “if we get married, this is your ring” and she was fine with it. I then told her I would get her another ring/necklace/bracelet she wanted down the road.